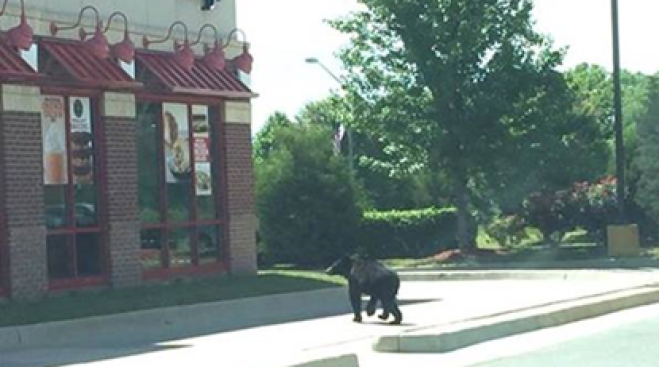 A black bear in Leesburg, Virginia, may have been looking for more than a picnic basket when it stopped by an Arby's restaurant. The young bear was caught walking towards the restaurant in the Battlefiled Parkway area Monday, the Leesburg Police Department said. There were multiple bear sightings in the area that day, police said. While bears generally avoid humans, they are known to wander into residential areas when searching for food. Pick up pet food and remove bird feeders. Clean your outdoor grill often. Do not put meat scraps or any other strong-smelling food in the compost pile. Pick up and remove ripe fruit from fruit trees. They can attract bears. If you do see a bear on or near your property, leave it alone. Bear sightings can be reported to the Department of Animal Services at 703-777-0406.